I guess many of you have been using Twitter nowadays and that includes me. Before, I don't update much because I don't how it really works not until Suzanne told me how to reply to my twittermates. Oh well you can update or put any message that you like and your mates can reply to you, it's like you are chatting at the same time. My co-bebots (digiscrappers) are all chatterbox that there are loads of stories, tips or chismax to read every day. 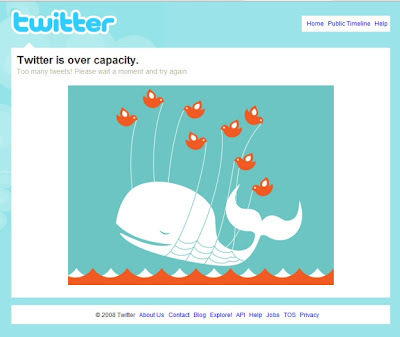 Lately, twitter has been experiencing technical problems and I know they have fixed it, and just this afternoon, i got an error that "Twitter is over capacity", it only means that many are using the service already. Have you twit lately?